After a long and exhausting day, there's nothing better than sitting down to a delicious cocktail with a blanket and the remote and watching an hour of trash TV. My dear husband has learned that there is a particular look I get at the end of a terrible day that suggests he'd be better off silencing his complaints about my dramatic TV shows and just coming along for the ride. Fall is officially my favorite season, but here in Hawaii, it doesn't exist in nature, so my only option is to create some sort of artificial fall wonderland in my home. Garlands of fall leaves, pumpkins and gourds and spice scented candles are pulled from storage. I make pumpkin muffins and pumpkin pancakes and roasted root veggies with pumpkin vinaigrette dressing. And inevitably, my cocktail repertoire gets an infusion of fall flavors as well. Tonight, I decided to play with a new bottle of honey-ginger syrup my husband picked up at the liquor store and concocted this delightful combination. It uses rye whiskey, which is so far outside my normal drinking routine, but seems seasonally appropriate. 1 1/2 -2 1/2 oz. of rye whiskey (I used Templeton's). Mix this to taste (and how early you have to be up the next day). 1 oz honey-ginger syrup. (I used a bottled variety, but I included a recipe for an easy homemade version below). Mix a spoonful of sugar and a dash of cinnamon in a shallow dish or small saucer. On another saucer/plate, add a few drops of honey-ginger syrup. Place the rim of the glass on the plate with the syrup and twist to coat the entire rim, then dip the rim in the cinnamon sugar. Add a large cube of ice. In a shaker, mix the rye, lemon juice, syrup and juice or cider. Add a cube of ice and shake to combine. 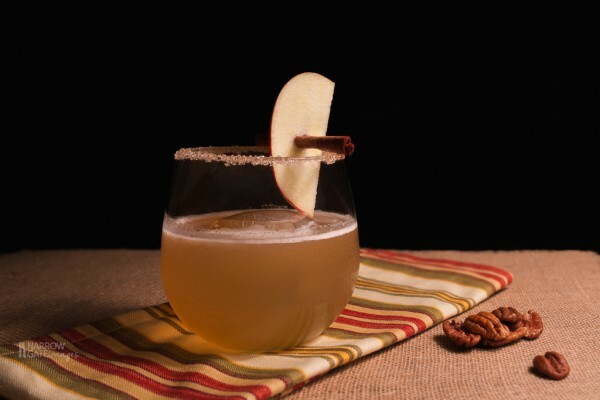 Strain the cocktail mixture into your rimmed glass and garnish with an apple slice and cinnamon stick, if desired. In a small saucepan, add 1/2 cup honey and 1/2 cup water. Add a 1/2 inch piece of ginger (peeled and sliced) to the pan and heat over medium heat until mixture boils. Allow to reduce for a few minutes, until it reaches a syrupy consistency. Remove from heat and cool. Store in a jar or lidded container in the refrigerator for up to 10 days.